In His middle age, Hazrat Muhammad ﷺ embarked on a spiritual journey of finding the purpose of existence on earth and True God. He used to visit a small cave of Hira present on the Peak of Jabl al Nur (Mountain of Light). At the age of 40, He (PBUH) finally received the first Revelation from Allah SWT sent through His Angel, Gabriel (Jibrael A.S) on 27th of Ramadan. Muslims all over the globe worship the Almighty Lord in last Ashra (10 Days of this Holy Month) to find Lailatul Qadr in association with discovery of the Sacred Book in it. In the previously stated recounting of the original happening, it can be deduced that the Messenger ﷺ Allah upon receiving the First Heavenly Exposure, was in a state of great surprise. Jibrael (A.S) repeatedly told Him to read by The Name of The Creator, although He (PBUH) had not the ability to do so. It shows that Allah SWT has blessed the entire world population through educating the Holy Prophet ﷺ first Who then became the source of ultimate enlightenment for His followers till the End of the World. Surah Al-`Alaq is no doubt the very first Chapter to have been revealed on the Holy Prophet ﷺ but it comes on 96th number in the Hallowed Manuscript. It contains 19 Verses in total. It is short yet highly comprehensive Interval of Furqan e Hameed containing the most important instruction of getting knowledge and Knowing about the Creator of the universe. 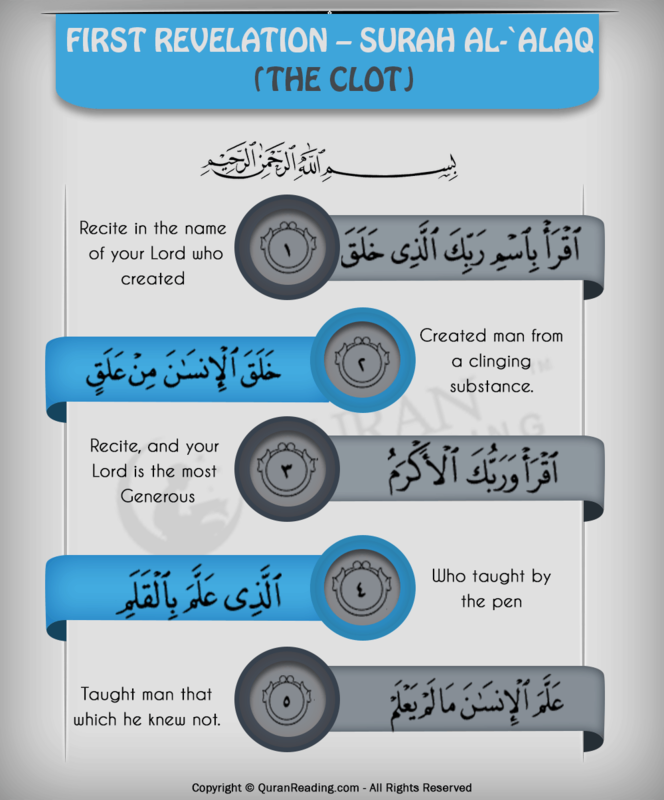 The first Heavenly Disclosure of the Holy Quran included initial Five Verses of Chapter, Al-`Alaq, which refers to “a clot of blood”. In the above mentioned Ayats of this Blessed Chapter, Allah SWT directs every individual to get acquainted with His Instructions by taking His Name, as He is the One Who produced a person from a lump of blood. Then, the Gracious God tells about His Kindness that He has bestowed upon all human beings. He educated a man by giving it conscious and understanding, and things which he never knew before. The very first Ayah of Surah al-`Alaq emphasizes on reading and interpreting the meaning of the Holy Quran with the Assistance of the Most Merciful. It has two basic instructions in it: first of all, the Almighty Lord directs one to read and acquire knowledge of Furqan e Hameed. The second thing is to ask Allah SWT to guide one to put the acquired information into proper use and that is only possible with the Help of the Creator of the world of the worlds. Thus, before start reading the Holy Quran, every believer is commanded to plead the Most Beneficent to grant it enough insight of the true wisdom of Quranic Instructions so that it can be acted upon in the rightful manner. That is why, before recital process and every other task, a Muslim requires saying “Bismillah-ir Rahman-ir Rahim” meaning “Starting with the Name of Allah, the Most Beneficent, the Most Merciful”, which is the declaration of dependence on One God Almighty for accomplishment of all matters of life. Alaq is an Arabic word that means “Clinging or Attachment”. The second Verse of this Blessed Chapter of the Holy Quran sheds light on the process of creation of every human in the womb of its mother. The Almighty Lord has talked about this fact some 1400 years ago in His Book when the entire mankind did not know about it. The modern scientific knowledge also shares the same views about birth of an individual. The third Ayah of Surah al-`Alaq stresses on both acquiring knowledge and remembering the countless Blessings of Allah SWT as He refers to Himself here as “Akram-the Most Generous” which is the superlative form of the Arabic word “Karim-Generous”. It is also a great Favor of the Gracious God that one is able to read and get familiar with His commands in the Holy Quran, which ultimately leads to success in this world and hereafter. In 4th Verse of this Sacred Chapter, Allah SWT indicates towards His Blessing upon the humanity to learn, acquire and preserve knowledge with the help of a pen. A man does not only have the capacity to read and understand things but can also write them for future use. Mankind is able to save their precious advancements in many fields of life including Science and Technology, history etc. to keep a record of their precious contributions. It also gives the believers a message to write down the Quranic Revelations to spread them worldwide so that the entire world population could benefit from its wisdom. That is why these Verses were written down on different items in the age of the Holy Prophet ﷺ and later on preserved in a single form by Hazrat Abu Bakr Siddiq (R.A) and Hazrat Usman Ghani (R.A). The last and final Ayah of the First Revelation, i.e. 5th Verse of Surah al-`Alaq is about letting one know about the great significance of the Holy Quran and its teachings. This Sacred Book contains such information was never known to the human being before. It unveils the many unknown matters of life, things on earth and in the entire universe with such precision and accuracy that none of its verses regarding such topics could be challenged according to the modern scientific knowledge. For example, Furqan e Hameed forbids one from drinking liquor, which is medically proven to be injurious to health and conscious. In short, the initial Revelation of the Holy Quran that was disclosed upon Rasulullah ﷺ by Allah SWT contains the greatest virtues in itself. Indeed, this Sacred Chapter of Quran Majeed serves as a great stepping stone to think about Allah`s Mercy and Graciousness in all matters over His servants.